Greece is one of the most touristic countries and almost everybody pass by this city of Athens before travelling to the islands. It’s one of the most modern cities in the world, which has maintained its historic image. Everybody loves taking photos every day, and especially upon their trips. So to all you photographers out there, here are 5 amazing spots in Athens that you must pass by! On Monday, 27th February, the Greek people of Athens will be celebrating ‘Kathari Deftera’, aka Clean Monday, Orthodox Shrove Monday or Ash Monday. It is the first day of Orthodox Christian Great Lent that occurs at the beginning of the 7th week before Easter Sunday. The public holiday will be a day of great celebrations, delicious food and family traditions. Clean Monday is also considered to mark the first day of spring, Greeks tend to celebrate it with outdoor activities. A favorite place to hang out is Filopappos Hill where you will see many Greek families, young and old, picnicking and flying kites! The hill is situated just opposite the Acropolis and even if you don’t have a kite, the hill offers the most amazing, uninterrupted view of the Acropolis and beyond to Pireaus, Aegina and other neighboring islands (but the kite is highly recommended). So go out and enjoy this festive event along with your glass of wine and ouzo to the sound of live music provided by the municipality of Athens. Have you ever wondered why in Greece at Christmas, we decorate boats? The Christmas Boat (Karavaki- Little ship) is part of a very old Greek tradition. It comes from the Islands where each year children go door to door singing ‘kalanda’ (Christmas Carols) usually accompanied by instruments such as triangles, guitars, accordians and harmonicas. The children on the islands carry small wooden boats, either illuminated to light the way or with enough space to store treats given to them by the residents they sing for. Some claim that this custom’s roots are linked with the December 6th Celebration of Agios Nikolas (Saint Nicholas) who is the Patron Saint of Sailors in Greece. The tradition also dates back hundreds of years when many Greeks were working as seamen. During Christmas time, when many were returning home after a long time at sea, their wives would celebrate by decorating small wooden boats as a way of saying welcome home. This tradition has gradually spread inland with people all over the country beginning to decorate model wood or paper boats with lights and ornaments at Christmas time. Traditionally the boats are placed near the door or fire with the bow pointing inwards, this symbolises the boats making their journey towards the mainland. Sometimes coins or gold objects are also placed in the boats to symbolise riches entering ones home. Surprisingly the Christmas Boat tradition has only become popular in the mainland in and around the last 30 years and is comparativley new compared to the Christmas tree. The reason for this is that the Greeks are aware that the Christmas tree is not traditonally part of their culture and was actually imported by their first king, Otto of Bavaria. They wanted to begin their own tradition using the boat, and by the number of people that seem to have taken up this tradition it has been very sucessful. Ανοιχτό από νωρίς, για καφέ και αργότερα φαγητό και ποτά, στον εσωτερικό χώρο της ταράτσας ή έξω, εκεί που θα απολαύσετε τη θέα νομίζοντας πως θα αγγίξετε την Ακρόπολη. Το Athenstyle rooftop bar από 1 Οκτωβρίου ποντάρει στην θετική διάθεση, φιλική ατμόσφαιρα και χαλαρές μουσικές. Κάθε μέρα από τις 11 το πρωί μέχρι την 1 το βράδυ. Open from early in the morning for coffee and later on for food and drinks, either in the indoor or outdoor part of our bar, the only place that you will enjoy the view feeling like you can almost touch the Acropolis! As of October 1st our AthenStyle rooftop bar is focusing on its positive mood, friendly atmosphere and chill out music. Open every day from 11 in the morning until 1 at night. See you there! The city of Athens has one of the newest constructed metro stations in the world. 2 underground lines, and 1 overground. Look for the sign in the following photo, and you’ve reached a stop. It connects the one side of the city to the other, with the airport, the port and the train station being three of the most useful points. Of course most of the stops in the center have the historical sights right there, such as the following. The most historical spot in Greece, and one in the whole world, is located in the center of Athens! A wonderful and easy hike up one of the tallest hills of Athens, which leads you to this grand monument. The Acropolis Museum is also close to the underground exit, a place you should visit without a second thought! And of course this graphic area is full of beautiful cafes and restaurants, a great way to stop and re energize a while so you can continue your explore around this city! This stop is considered the main point in the center of Athens. The parliament of Greece is located right as you exit the underground. Also the National Gardens, which is worth taking a stroll around, to take a few pictures and admire all the nature in there. And lets not forget that once you cross the Syntagma Square, Ermou street begins. The main shopping street filled with many popular shopping stores where you can find anything you’re looking for! This is one of the best places to have a stroll in Athens. Located between Monastiraki and Acropolis. There is a wonderful outdoor market every day on a pedestrian street that you have to pass by. It begins right at the exit of the metro station so you can’t miss it. Another great area to sit for a meal at one of the traditional restaurants, or a beverage at a cafe. The party area! This area is full of bars, clubs and restaurants. 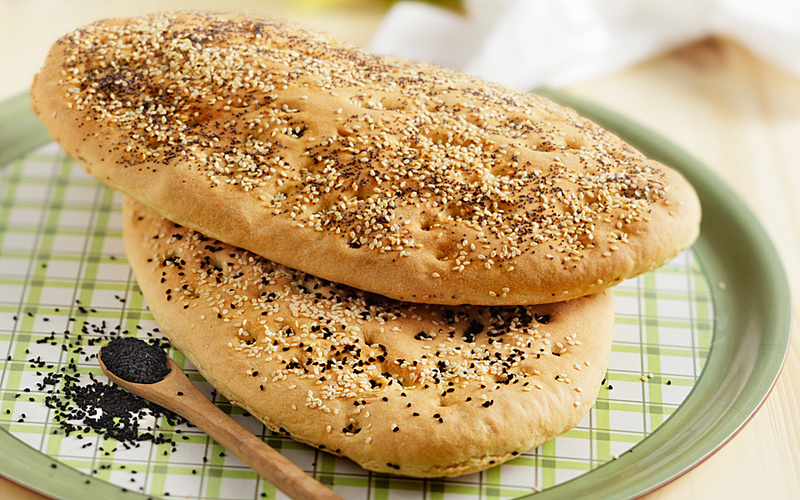 You might also hear it called Gazi. The best place to go and have a fun night! Note that the night begins around midnight here in Greece. And the clubs start closing easily after 6am at the earliest! This Greek experience will surely make an unforgettable memory to your trip! The square where almost all day and all night long, mainly in the summer, you will see people chilling and passing by. It’s the most central area of Athens, with a modern flea market right at the exit of the metro building. From the square there is a wonderful view of the Acropolis. Very close by is a beautiful area named Psiri, great to walk around and hang out. Also, as noted above, Ermou street ends close to this square, so you can shop in the opposite direction, towards Syntagma. Here is a helpful map you should have with you with all the Metro stations. So Athens is a city you must spend a few days in before or after you visit the islands. And guess which cheap hostel is right in the heart of ALL these spots? AthenStyle Hostel! 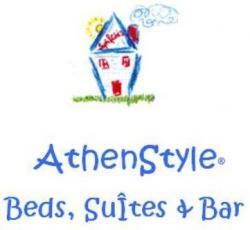 Head on over to http://www.athenstyle.com to make your booking for a dorm or a private room at a fantastic price! Tzatziki is one of the most famous Greek side dishes! Many say it goes with everything! 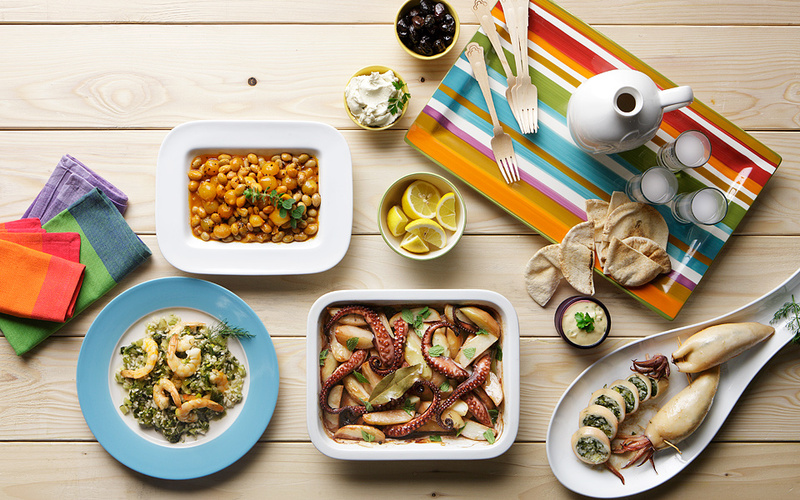 The main place you’ll find it is inside the world known Gyros pitta, but also with many other Greek dishes. Once you leave Greece, for sure it’s going to be one of the main things you’ll miss! So here we’re giving you the ingredients to make it at home, quick and easy! Just take a good amount of traditional Greek yogurt, grate about 4 cucumbers, and add some garlic. Mix it up and keep refrigerated. That easy! If you haven’t tried it yet, try it before your trip here, and for sure it’s going to be one of the dishes you will be awaiting to eat once you arrive! Upon your visit in Greece, a fun thing to do in your free time when you’re not exploring the cities, is to learn a few Greek tradition games. Some of these following ones have been around for ages! Backgammon is a main pass time game that Greeks play all around. If you take a stroll around from the center of Athens to the outskirts of town, you will see people of all ages in small cafes playing different games in this wooden box! In Greece it’s generally named Tavli, but a few different games that are mainly played are Plakoto, Fevga and Portes. People playing cards is also very common in Greece. Again, mostly in cafes. The majority of the elderly like to pass their time this way. Biriba and Paschenza are two main games that everybody loves.